The Loneliest Plant In The World : Krulwich Wonders... Millions and millions of years ago, the world was full of strange looking trees. Now, one of these tree species has dwindled to a single male plant who is desperately in need of a mate. One day in 1895, while walking through the Ngoya Forest in Zululand, southern Africa, a botanist with the oh so suitable name of John Medley Wood caught sight of a tree. It sat on a steep slope at the edge of the woods and looked different from the other trees, with its thick multiple trunks and what seemed like a splay of palm fronds on top. 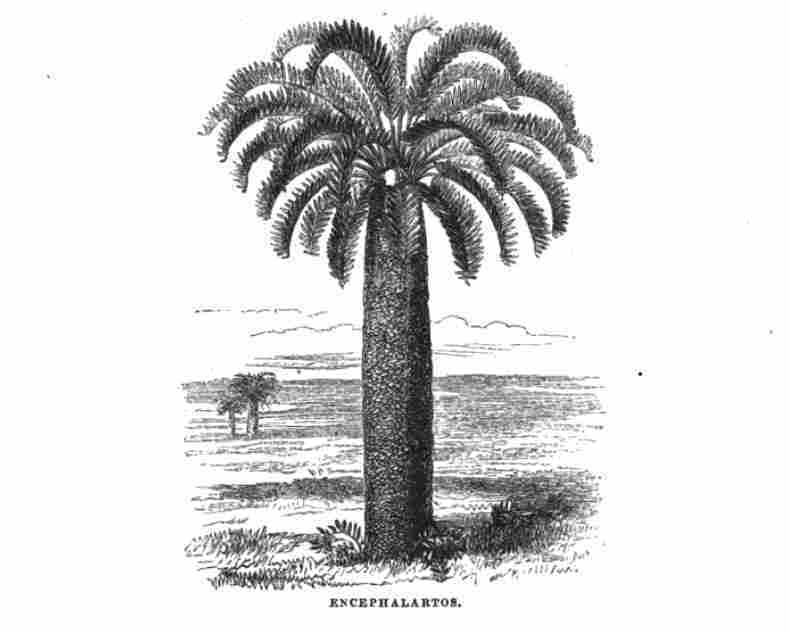 From a distance it looked almost like a palm tree, and Dr. Wood — who made his living collecting rare plants (he directed a botanical garden in Durban) had some of the stems pulled up, removed, and sent one of them to London. That little tree stem was then put in a box and left in the Palm House at the Royal Botanical Gardens at Kew. It sat there, alone, for the next 98 years. Named E. woodii, in Dr. Wood's honor, it is a cycad. Cycads are a very old order of tree and it turns out this one, which is still there in London, may be the very last tree of its kind on our planet, the last one to grow up in the wild. Two hundred million years ago, cycads were everywhere. Cycad forests reached from Greenland to Antarctica (though the continents were not where they are now). Pterodactyls flew through them. Big dinosaurs munched on them. 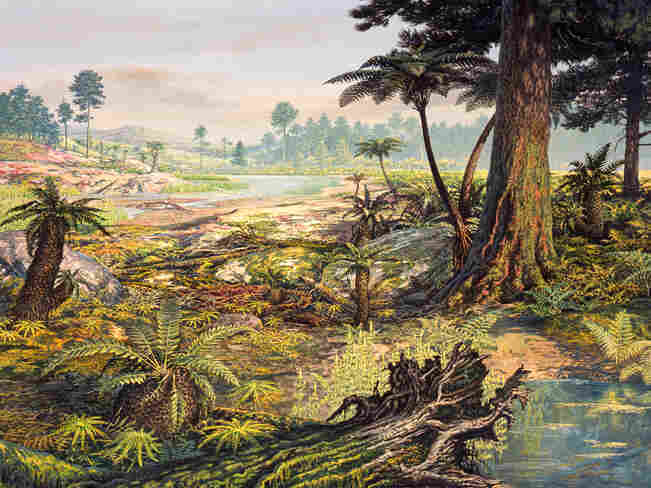 During the Jurassic period, small, stumpy palm-looking trees — the ones you can see in John Sibbick's painting — made up about 20% of the world's plants. Somehow these E. woodii survived the catastrophe that wiped out the dinosaurs, got through five different ice ages, learned to live with bigger, newer trees, conifers, leaf bearers, then a profusion of fruiting and flowering plants, got pushed into smaller, then even smaller spaces until there were merely tens of thousands, then thousands, then hundreds and then, perhaps, just this one. The problem is, these trees cannot fertilize themselves. Some plants contain male and female parts on the same individual. Not E. woodii. It is, as the botanists say, dioecious. It needs a mate. 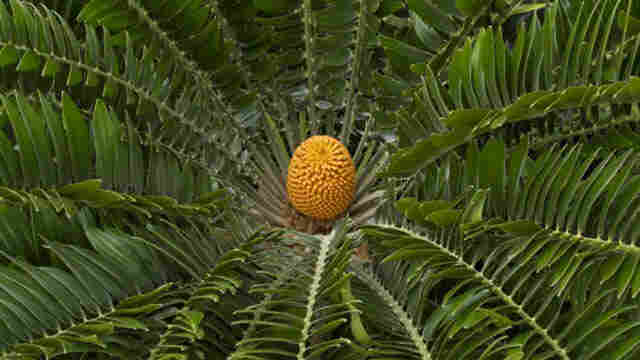 When a cycad is ready to reproduce, it grows a large colorful cone, rich with pollen or seed. It signals its readiness by radiating heat or sending out attractive odors to pollinators, who travel back and forth. Once fertilized, the seed-rich cone is ripped apart by hungry seed carriers (who've included over the years, not just birds and insects, but dinosaurs, pterosaurs, bats; these trees have been eaten by just about everybody). But what if you can't find a mate? The tree in London (and its clones that are now growing in botanical gardens all over the world) is a male. It can make pollen. But it can't make the seeds. That requires a female. Researchers have wandered the Ngoya forest and other woods of Africa, looking for an E. woodii that could pair with the one in London. They haven't found a single other specimen. They're still searching. Unless a female exists somewhere, E. woodii will never mate with one of its own. It can be cloned. It can have the occasional fling with a closely related species. Hybrid cycads are sold at plant stores, but those plants aren't the real deal. The tree that sits in London can't produce a true offspring. It sits there, the last in its long line, waiting for a companion that may no longer exist. J. R. R. Tolkein, in his The Lord of the Rings series, imagined this situation in a different way. He wrote of a race of "tree spirits," who could move (slowly), talk (even more slowly because their lifespan was so long, they never had to hurry). 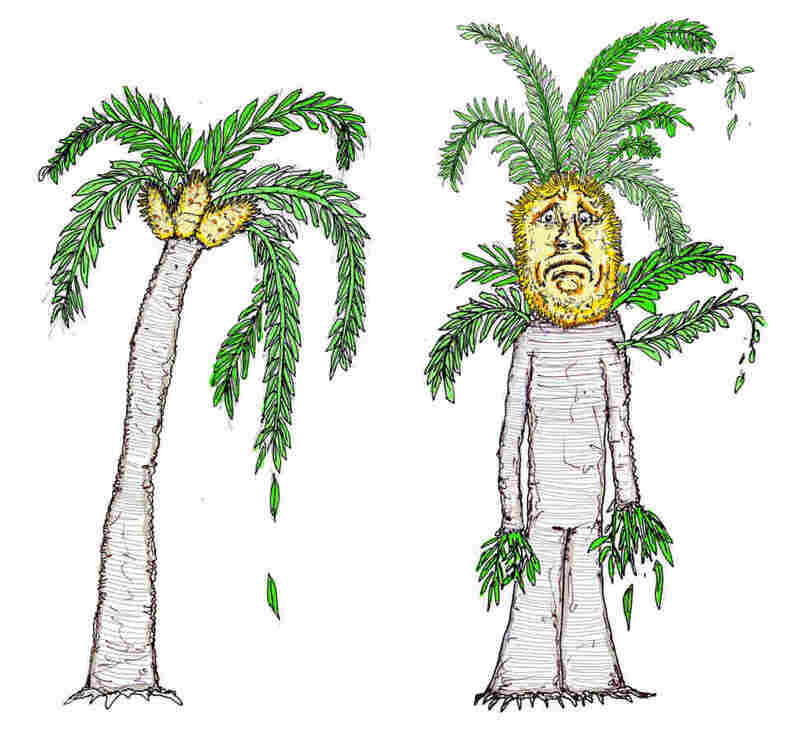 He called them "ents" and they too lost their females; their "entwives" had wandered off to a distant, devastated and unreachable place, and now the male ents were unable to mate, and like the last cycad, they were doomed. Unless...(there's always an "unless..."). 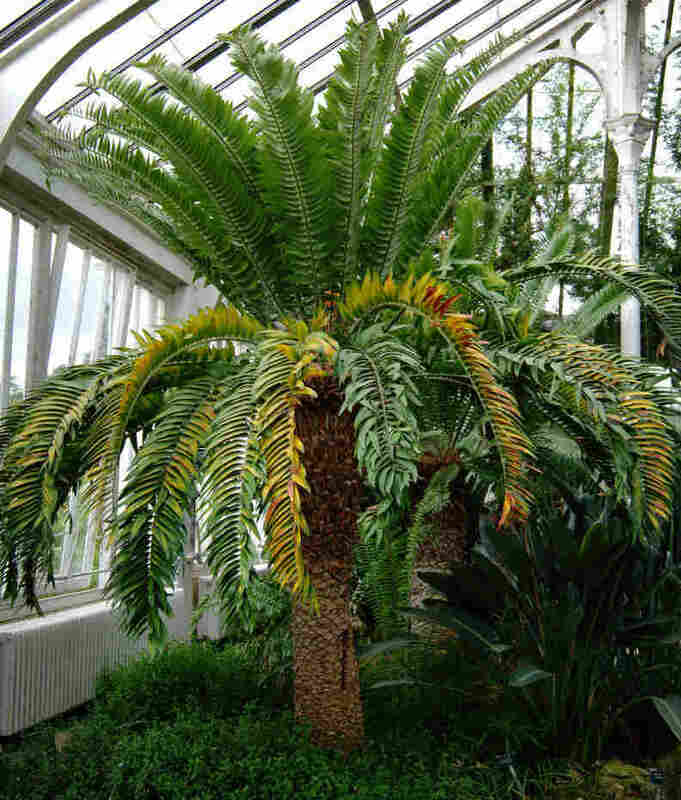 In 1997, the London cycad was moved out of Palm House (it isn't a palm) and planted in a bed along with other South African plants at Kew Gardens. Seven years later, in 2004, for the first time ever, it produced a bright orange/yellow male cone. It can still do what it has to do. But it can't do it alone. The great British biologist Richard Fortey talks about the London E.woodii in his classic Life: An Unauthorized Biography (Vintage, 1997). Oliver Sacks describes his personal encounter with the Kew cycad in The Island of the Colorblind (Vintage, 1997). Illustrator Josh Kurz regularly contributes to this blog. He recently created an enormous stack of fish cans to illustrate acceptable ways to spell the word mackerel.